Sephardic Weekly Shiur On December 7, I had the pleasure of attending a special series of classes held weekly in Chabad at Rutgers’ Sephardic synagogue. Taught by Rabbi Malka, the classes focus on Sephardic Jewish traditions. During both the fall and spring semesters, Rabbi Malka enthusiastically journeys to teach a crowd of students in Chabad’s newly built Sephardic synagogue. This series was coordinated by Isaac Sasson, a senior at Rutgers University, who personally knew Rabbi Malka from his hometown Jewish community. “It’s a way to keep the students involved in all types of Jewish traditions,” Isaac stated with a smile as he indicated the multitude of eager students listening to Rabbi Malka’s words. Besides great teachings, attendees are also offered to a completely free dinner and are welcome to take home any leftovers. Additionally, for many students, though especially the Sephardic community on campus, Rabbi Malka’s weekly talks are the students’ favorite part of the week. With that said, it’s not hard to see why so many students enjoy attending the event. 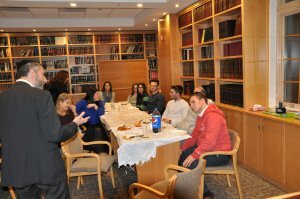 Besides enjoying great good and lessons, the weekly class is a great way to build a community of Jewish friends. Although I had never attended Rabbi Malka’s class before, the welcoming attitude of the students made me feel right at home. Just as I’m sure any newcomer on campus would be, I was warmly asked to sit with a group of students. By the end of the class, I knew all the names of my classmates who were initially complete strangers to me. 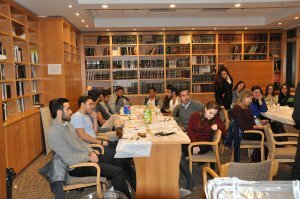 Furthermore, Rabbi Malka was also openly welcoming to students who paid a visit to his class, and made sure to offer any newcomers some of the delicious food and a seat in the class. Despite the fact that I am a junior at Rutgers University, I can clearly see that an event series like this would be a perfect opportunity for a freshman or transfer student to make new friends in the Jewish community. The particular lesson that I was present for took place during the second day of Chanukah, and so accordingly Rabbi Malka explored the question, What makes the mitzvot of menorah special? To answer this, the Rabbi began by differentiating between the spiritual and the physical. The physical takes place in the form of our environment and the spiritual concerns the soul. In the story of Chanukah, a small army of Jewish people were surrounded by the physical threat of Grecian soldiers eager to destroy Jerusalem. By spiritually relying on G-d, they were able to overcome unlikely odds and win victory after victory against tens of thousands of soldiers. After the battles ceased, and the Jewish victors found the last remaining flask of purified olive oil, the miracle of it lasting for eight days has a spiritual meaning. Seven in the maximum in physicality; there are seven shades of colors, seven music notes, and seven days in the week. Eight, on the other hand, is the paragon of spirituality. In other words, the mitzvoth of lighting the Chanukah candles, like all good deeds, has a greater spiritual meaning. Attending Rabbi Malka’s class personally reminded me of important lessons of holding on to virtue. Especially as a student, all too often it is easy to get caught up in the hectic rush of studies and forget the vital importance of community service. As I observed my classmates around me, I realized that sessions like the Sephardic Weekly Shiur not only bring us connect us through our Jewish learnings, but also serve as important reminders for us to be kind to one another. While there is no grade for doing good deeds (at least in the earthly world), such acts are still an integral part of not just being Jewish, but also being humane. For more information about how to get involved and about Chabad House at Rutgers, visit us on the web at www.chabadrutgers.com, www.chabadnj.org, or call 732-296-1800.